Members of the 60 strong Wycombe Orpheus Male Voice Choir come from all walks of life, Directors, accountants, decorators, pilots, teachers, IT Gurus, marketing consultants, journalists and even a surgeon. We all share a common interest, the love of singing. Why not join us? We’ve heard all the excuses, “I can’t sing well enough”, “I’m too busy”, “I can’t read music” etc. Just forget these for a moment and read on. Health - there are many articles extolling the health benefits of singing. Singing like yoga involves good breathing techniques and helps to alleviate conditions such as asthma and stress whilst at the same time promoting a feeling of wellbeing. Learning music also helps with, um, now, what was it? Ah yes the Memory! Camaraderie - When the Choir was surveyed on what they enjoyed, camaraderie was top of the list. The common purpose and team work pull us together, and we also have a full programme of social events including an Annual Dinner in winter and a summer event such as a Riverboat trip or Hog Roast which allow us to bring along our families and supporters. Doing good - most of us like to do something for charity. 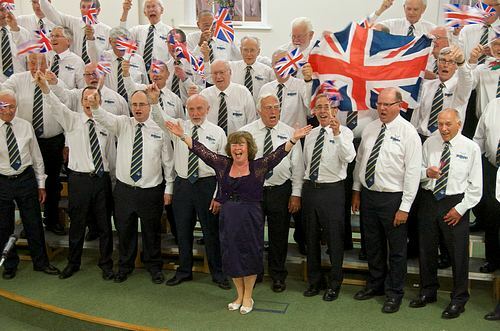 The Choir raises thousands of pounds each year and provides enjoyment to audiences small and large. Recent charity beneficiaries have included Rennie Grove Hospice Care, Chiltern Prostate Support Group, and Thames Valley Air Ambulance. Our annual Young Musicians Festival encourages the musical endeavours of our local most talented youth players, and our Bursary funding offers practical support at critical stages in their musical development. Venues – As well as local venues such as Wycombe, Flackwell Heath, Amersham, Beaconsfield, Marlow, Maidenhead, the Chalfonts and Gerrards Cross, we’ve performed at the Albert Hall, St Albans Abbey, Wells Cathedral, The Eden Project, The Swan Theatre, Lakeside Country Club, Jersey, Llangollen, Cornwall, Cardiff’s Llandaff Cathedral and Millennium Centre, and Bury St Edmunds to name but a few. Prestigious locations like London's Mansion House and Guildhall have resonated to the Orpheus Sound at major charitable events - as a result of our high-profile Patrons Gloria Hunniford and John Ratcliff CBE who have encouraged such performances to our mutual benefit. In complete contrast the aisles of our local Tesco have also rejoiced in our Christmas cheer! Achievement - We’ve appeared on television, made 5 of our own CDs and featured in several others. Hobby - every man needs a hobby; singing is one that can last a lifetime and rarely results in injuries! It is also one partners can feel a part of, many wives actively encourage their husbands to join! Enjoyment - with all the other benefits it’s very easy to forget how enjoyable singing is!! Very few people fail to derive enjoyment from singing whether it be at a football or rugby match, carol singing at Christmas, or even just in the shower. Add to that the Social events that are an integral part of every Orpheus year, and we are proud of the cameraderie the Choir engenders, and the positive involvement of Choir partners and families in our social activities. Trendy – yes, following Gareth Malone’s inspirational TV work establishing Community and Workplace Choirs, and Only Men Aloud’s victory in Last Choir Standing, it is now trendy and the “in thing” for men to sing! What Do We Sing? – Songs from hit West End musicals, pop classics, hymns & arias - such as Angels, I Dreamed A Dream, The Rose, Soldiers’ Chorus, The Impossible Dream, You Raise Me Up, Memory, Music of the Night, The Wonder of You, You’ll Never Walk Alone (complete with football scarves! ), Bohemian Rhapsody, She, Can You Feel The Love Tonight (from the musical Lion King), Morte Criste and Mansions of the Lord. Oh, and songs from the Beatles, Abba, and most recently Coldplay show we can keep up with popular trends while doing justice to our Male Voice singing roots. I’m too young – too old? We still have active members who have been in the Choir for over 50 years but recent joiners are still bringing up young families and view the Choir as stimulating relaxation from their busy working and family lives. Most men can sing especially when supported by our learning downloads that pick out all the notes, and regular line practice at and between rehearsals. Reading music is not essential. Are you really too busy to invest a couple of hours a week for a healthy, lifetime hobby, making new friends, doing some good whilst visiting splendid venues and enjoying yourself and achieving along the way? We meet at 7.30pm on Wednesdays at the Wesley Methodist Church, Priory Road, High Wycombe HP13 6SE. Or just come along to rehearsal. You will get a warm welcome and it will change your life for the better.